Hammerworks RG12 Onion Copper Wall Lanterns are the largest of the Colonial Onion Wall Lights in our collection. Especially relevant with it’s 12″ round globe it is most appropriate for a large home entryway or garage. In addition while it comes standard with a single light bulb socket to shine down from the top, you can choose to put in a 2, 3, or 4 light candelabra cluster. Therefore no matter which lighting option you choose your New England Style Onion Wall Lights will provide ample illumination. In addition you will find both the matching Hanging Onion Lantern HRG12 and Colonial Onion Post Lanterns PRG12 to perfectly coordinate with Cape Cod Style Onion Wall Lanterns. Most importantly, if you prefer Classic Colonial Onion Lights, then look no further! 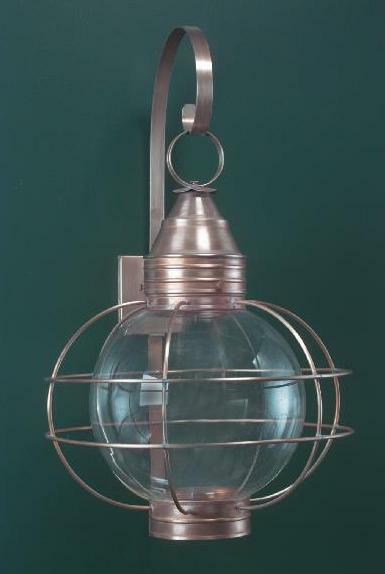 we offer a selection of Onion Post Lights, New England Style Onion Wall Lights and Hanging Copper Onion Lights. Therefore whether you are implementing an entire landscape architecture design or simply lighting a front entryway, you will find Colonial Onion Lights at Hammerworks. Furthermore, because we use only solid copper or brass to handcraft each Onion Lantern, they resist rust and corrosion and will last for years to come. Our Onion Wall Lights, Post Mounts and Hanging Lanterns offer exceptional quality that will no disappoint. We are proud to offer a selection of Colonial Ceiling Lights in addition to Colonial Ceiling Onion Lights. Therefore if you have a space with limited height clearance you can choose from several options. First of all Pierced Tin Ceiling Lights CL116 or Punched Tin Ceiling Lights CL117 are both charming options. Perhaps you prefer a simpler or more rustic look. If so then consider Copper Ceiling Lights 1032FF or Antique Tin Ceiling Lights CL113. No matter which style you prefer, you will find it at Hammerworks.